Tent Dimension in inch: 55" (Diameter) x 53" (H). Specially designed hexagon, provide a perfectly sized space, giving your children plenty of room to stand and play, even an adult can fit inside. Playing dress-up, have fun with friends, or read. Premium QUALITY - Tent was made from durable and long lasting polyester fabric and gauze, PVC pipes and has plastic connectors are good quality plastic with no sharp or rough edges completed with tight seams and solid construction. An adorable gift for all girls! This is the cutest princess tent .keep the kids entertained ,reading, relaxing and enjoying the peace in their tents. What kid doesn't like forts and tents and little secret places to hide. 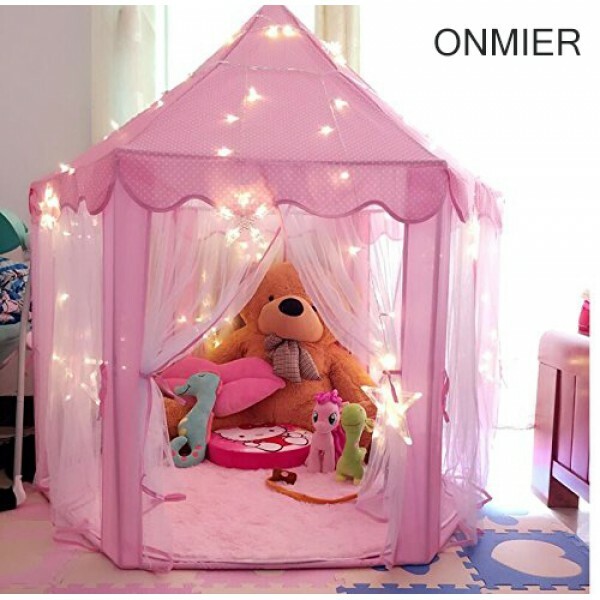 * This princess castle play tent is an adorable Holiday or Birthday gift for your kids. * Multi-purpose ：Playing dress-up, have fun with friends, or read, etc. Your kids will love this play tent definitely! * Encourages dramatic play and provides hours of fun for kids! Inspire children's imaginations while giving them a private space of their own. * Tent dimension: 55" (diameter) x 53" (h). Specially designed hexagon, provide a perfectly sized space, giving your children plenty of room to stand and play, suitable for children 1- 10 years old. * Security: PVC pipes and plastic connectors are good quality plastic with no sharp. * Easy to move or take down when not in use. The tent comes with a carrying bag, making it easy to store when it's time to put the tent away.